The latest SEVIS by the Numbers report provides a snapshot of foreign enrolment in the US as of 5 March 2018. It finds the number of international students in the country decreased marginally (-.5%) when compared to March 2017’s enrolment levels. As always, the SEVIS data is interesting for its ability to provide something close to a real-time snapshot of student numbers in the US. This is distinct from the landmark Open Doorssurvey conducted by the Institute of International Education, which relies on data from the previous academic year. It can also be distinguished from other US government data focused on visa issuance, which reflects the volume of commencements and visa renewals for a given period. Each of these data sources contributes to our understanding of the evolving enrolment trends in the US, and this latest SEVIS data release underscores on observation that has been made of the US market over the last year. For the first time in decades, foreign student numbers in the country are not only not growing substantially, they have actually declined. The latest data reflects that the total number of active F and M students decreased by .5% over the past year, from from 1,208,039 in March 2017 to 1,201,829 as of March 2018. Much of this decline appears to have been among students seeking two-year associate degrees in the US, whereas the numbers of those pursuing bachelor’s and master’s degrees held relatively stable throughout the year. As the following illustration reflects, the number of Latin American students in the US actually increased by more than 4% over the year, but those gains were offset by marginal declines from European and Asian markets. Africa registered a nearly 2% increase for the year, led by the key emerging markets of Nigeria, Kenya, and Ghana which respectively grew by nearly 8%, 6%, and 5% year-over-year. 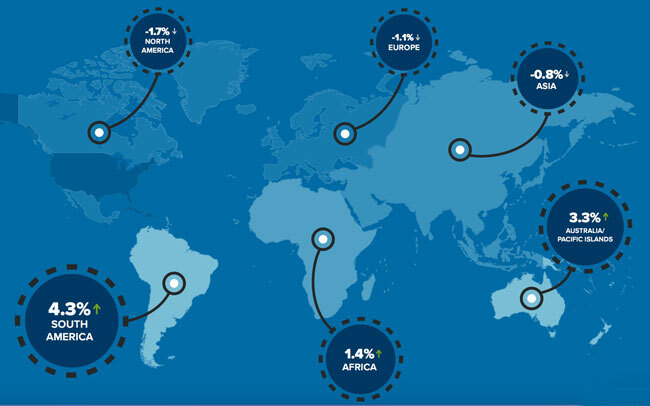 In comparison, the more notable growth from Latin America came from Brazil (+13%), Argentina (+7%), and Chile (+6%). As we noted earlier, the all-important Asian region was off marginally for the year, in large part because enrolment from some of the leading senders for the US have stopped growing as quickly or even fallen off. Nearly eight in ten foreign students in the US come from Asia, and just under half of all F and M visa holders (49%) come from China and India alone. Both of those key markets grew marginally over the last year at 1% and 2% respectively. Needless to say, however, this is well off the growth rate for both markets over the last decade and more. Meanwhile, South Korea remains the third-largest sender for the US even as its declining trend continues this year with a nearly 8% drop-off between March 2017 and March 2018. 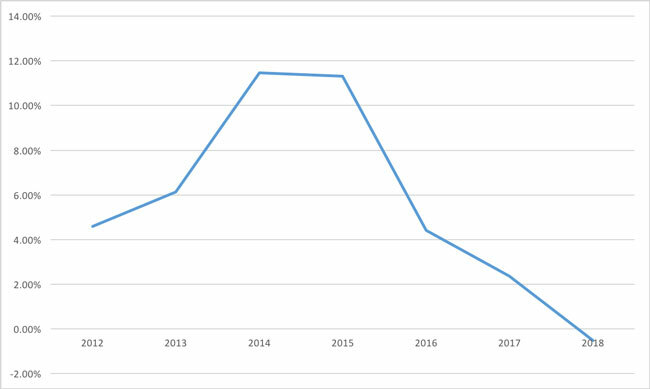 The next-largest sender, Saudi Arabia, was also down again this year (-17%) as the winding down of the long-running King Abdullah Scholarship Programme continues. The unmistakable trend here is of slowing or even declining growth. Needless to say, this is a pattern, as illustrated in the chart below, that carries with it significant implications for recruiters in all sectors of US education.